It’s been a whirlwind of a tour here in Japan. From the picturesque mountain countryside of Gunma, to a lakeside hotel in view of Mt. Fuji, to the packed city streets of Tokyo, every day has been an adventure. I’ve been shopping at used kimono stores over the past few days, finding many treasures and selecting pieces for the shop, but yesterday was a special treat. 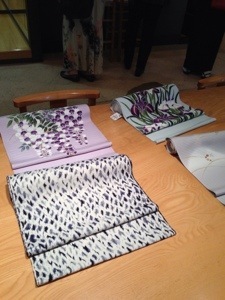 Our friend and guide Megumi san took us to see new kimono shops and introduced us to the owners. We visited department stores, small shops in malls, and one very special high-end boutique, where we saw some exceptional pieces. I’ve been selling used kimono since 2005, starting off with just the fabric bolts and eventually learning how to wear kimono and dress myself and others. The geometry of the garment is fairly simple; complexity comes in the execution of it. From design and embellishment to the wearing and accessorizing of it, a kimono can be as timeless as a Chanel suit or as tacky as a polyester leisure suit. 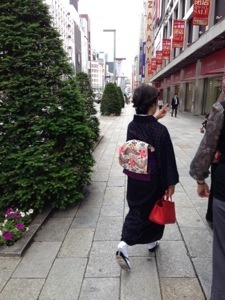 A quality kimono is evident from a distance, but not by shouting. It expresses itself with a subtle but distinct voice. And it isn’t cheap. Many of us who buy used kimono are accustomed to spending $100 or less for silk, and even less than that for cotton yukata. When new, a quality silk kimono can cost thousands of dollars, and yukata may cost hundreds. 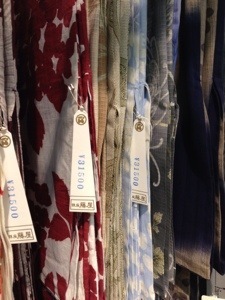 For example, the yukata in the above image are roughly US$320 apiece, and that was at a mid-range mall boutique. At a high end shop they may cost significantly more, depending on the material, weave, and artist. Customer service is reflected in the price, too. At a bargain shop you may find busy ladies dressing their customers, matching up kimono and obi with obijime, zori, and other accessories. The space is cramped, the shelves crowded with layers of colorful chirimen, kasuri, meisen, ro, etc. the prices are decent and the quality is fair. These shops are fun and affordable for many young women who are learning to wear kimono and building a wardrobe. Higher upmarket you’ll find mall shops with clean and tidy displays of kimono waiting to be custom tailored, and bolts of silk waiting patiently in drawers and on shelves. Some stand-alone boutiques offer new and used kimono in an elegant setting, with sales people who will shadow the customer through the shop, offering suggestions and advice with patience and grace. At the high end… That’s where things get really special. I’ll talk more about that later.